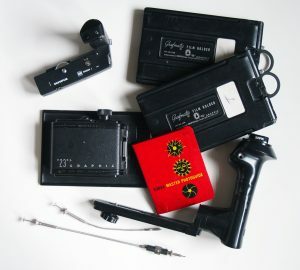 I have been going through my speed graphic view camera case that is packed with old camera equipment. I was thinking about making a change as far as using my OM 4 for making images and then scanning them as opposed to only using the digital camera. As a film photographer, I cannot let the silver image go as there is a wonderful illumination in the prints that cannot be duplicated via digital. Technology has moved along so as to make the use of both film and digital a reality for the photographic artist. Anyway, as I pulled out several items I had so many memories come flooding back from times i used the equipment or observed it being used by family. Cables and light meter used in taking photos of Chuck Norris and his black belts for the annual training we attended in Las Vegas. I was the official photographer for several years before 9/11 when I was called to go to Afghanistan and Iraq. There is an old transistor radio my grandfather gave me that I used to listen too as a young teenager; some old un-used flash bulbs, you know the ones that look like they have steel wool in them. We used to take a battery and set them off and tried not to get burned by coating on the bulb as it was heated from the flash. The Grafmatic film holders remind me of the dumb question I asked Bruce Barnbaum at a workshop. An old folding wood yard stick that I kept for some crazy reason. 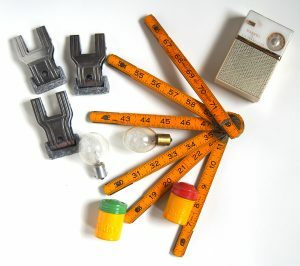 That was the go to ruler as the metal measuring tape was not to reliable or available at the time. Metal film hangers, filters, auto winders, old metal Kodak film containers, and so many other items that are now mostly memorabilia. I would bet most would see it as junk but they are tangible links to a past filled with photographic experiences. These photographic items in many ways are no different than the images I have made over the years. Not snapshots of the family and events, but of art I tried to create or was inspired to create. They are the link to a past I cherish and treasure. At times I wonder if my kids will appreciate them, but having lived through the passing of my father and grandmother I discovered the things they left behind were from their lives, from their memories. They left behind the mementos of their lives. Some of the items make seemingly little sense to me, but that is not relevant. For my father and grandmother they were items deemed have had importance in their lives. My mother just told me she wants me to have all the photographs of her family, since I am the photographer and know how to care for the old images. I currently have all the images from my father. The family stated I was the best one to archive and organize all the images since I was an art photographer. And while I provided digital copies to my family, really the images left behind are what my father kept to remind him of his life and the things he experienced. Faces and places in the photos of my father are unknown to all of us but him and now he is gone. I have a digital photo display where images of the family are displayed on the small LED monitor. Images important to my wife and I but certainly not to anyone else. Looking through my photo art prints, they are important to me, and bring back memories of the time and place the image was made, the efforts to record the image on film or digitally, processing the film, the printing and finally the viewing of the final print. Certainly these images are important to me and may be to others, but only a few images will resonate with an audience larger than my family and me. I know this from experience since people like the images I have created, there are relatively few who will actually purchase the image and bring it into their lives. I know that when leave this dimension I will have left behind remnants of my life that are relevant only to me. And, LOL, to others a lot of junk to sort through. And while some of the photo equipment can still be used, most of it will be tossed into the junk bin of the past. But for now I cherish each item for the memories it evokes and the prints that reveal an inner sensitivity to life I have not always shared openly.